Emergency Preparedness - Letter Sent To President Tests Positive For Ricin - That's Sick! Lucy had no reason to believe today would be different than any other. She just completed her midday break as she had done numerous times before. She finished the last sips of her coffee. “Only a few more hours left,” she thought. Lucy is a happily married mother of two that works as a supervisor at a mail sorting facility that screens the mail intended for the White House, Senate and the House of Representatives in Washington D.C. After 12 years and her work ethic, professionalism and integrity helped her rise to the supervisor position. Scientist examines the contents of a threatening letter. Later that day, Lucy returns to her position in the screening area and settles in for the afternoon with her co-workers. Together with her team, she examines every piece of mail thoroughly looking for any suspicious indicators of possible threats to the legislators and executives. So far, like most afternoons, all the letters appear harmless. She clutches an open letter with a Tennessee postmark and no return address while white powder falls onto her work bench. Lucy rapidly approaches, peeks inside at the writing and reads “You haven’t listened to me before. Now you will, even if people have to die." Once the area was vacated, Lucy notified her supervisor to report the incident and what she had discovered. Months before they had worked with area partners such as the fire department Hazmat team, the FBI Weapons of Mass Destruction (WMD) Division and the local public health laboratory that was the nearest member of the Laboratory Response Network (LRN) in a drill exercising for an event exactly like this, as they had done multiple times in her tenure at the facility. Lucy’s training kicked in, and she knew that timeliness was critical to a possible emergency response. She hung up with her supervisor and immediately called 911 and described the situation. Lucy’s call then set off a chain of events that spurred immediate action. The Hazmat team sprung into action and contacted the FBI WMD Coordinator and they all met onsite at the mail facility. The FBI performed a threat assessment to verify that the letter was indeed a credible threat. Lucy was confident that would not be an issue. Once the threat was deemed credible by the FBI, they notified the preparedness director at the LRN laboratory. Lucy remembered from her trainings, that LRN laboratories provided testing for these events. Hazmat team demonstrates radiological testing in laboratory spill exercise. Lucy took a deep breath and gathered her wits. Her next phone call was to the safe room where her co-workers had gathered. She spoke calmly “this appears to be a threatening letter situation like the drill we had a few weeks ago.” Not wanting to induce panic, she added “it is unlikely that any of you are in any kind of danger and I have notified all of our external partners of the situation so they can begin their investigations and also provide you with any care you might need. I will stay in here and assist the responders while they are in the building. Please remain free of this area until further notice. We will keep you posted as we gain new information.” Lucy hung up the phone. Once all of the relevant partners had access to the work area where the specimen was located, the rest was out of her hands. She anxiously waited for the results. The hazmat screen was negative for explosives and corrosives, radiological material and volatile chemicals. Her mind began to ease and her stomach started to unknot. The FBI was now clear to deliver the specimen to the LRN laboratory for further testing. Lucy was proud of her response. A day that had once seemed normal turned chaotic in a matter of seconds. Her actions were swift and her training and preparedness allowed for a rapid response and prevented the letter from advancing beyond the sorting facility. Then it dawned on her, the letter was intended for the President. Another spinal chill and she literally shook with this one. Lucy grew nauseous. She was very anxious to hear the results from the LRN laboratory. Lucy showered in the on-site decontamination shower, washed her skin and hair thoroughly and changed all of her clothing. Since she displayed no symptoms and the rapid screens were negative, she was able to return home for the night. She tried to rest that night, but as the day kept replaying in her head, she found sleep eluded her. She anxiously awaited the official laboratory results. 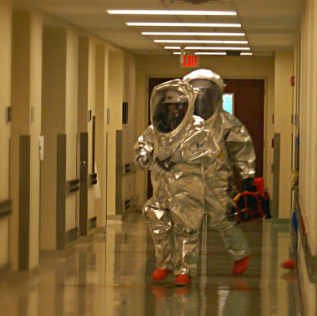 Hazmat team screens materials for the presence of radiation during a laboratory spill exercise. Early in the morning, she was awoken by a call from the FBI agent working the case. The LRN laboratory confirmed that the white powder from the envelope tested positive for Ricin toxin. Lucy was terrified. She remembered from the training that the laboratory had given them a list of possible agents used in an attack like this but could not recall the symptoms or treatment for this toxin. She could only recall that it was highly toxic and that there was no antidote and therefore, no real treatment. Some quick research gave her the information she sought. Ricin toxin could be ingested, injected or inhaled and cause illness. She was not concerned about injection or ingestion. She hadn’t eaten any of the powder. She pondered inhalation. She read that routinely the toxin will cause illness and respiratory distress within 4-8 hours, but definitely within 24 hours. “I don’t feel ill and am not having any trouble breathing,” she thought. She was well over 12 hours away from her original exposure. Her worries began to diminish. Lucy had an after action meeting with her co-workers where they reviewed the events from the day before. The episode confirmed the importance of their job and also stressed the need to remain focused while working in the sorting area. They reviewed the processes that were exercised both in the drill and in the actual event and found that Lucy performed everything exactly as they had practiced it. She was commended by her supervisors for her swift and decisive actions. They reaffirmed that her courage and willingness to act likely saved the lives. Lucy was relieved. She was grateful to have taken place in so many preparedness and response trainings through her work. They had her prepared for the actual incident. She was also thankful for all of the external partners that she relied on for this event. Their roles were clearly defined in advance, and their response, like hers, resulted in minimal exposure and no loss of life.